Ghirardelli White Chocolate Flavoured Sauce is rich and creamy, and is especially formulated to complement strong espresso flavoured drinks with its added vanilla note. 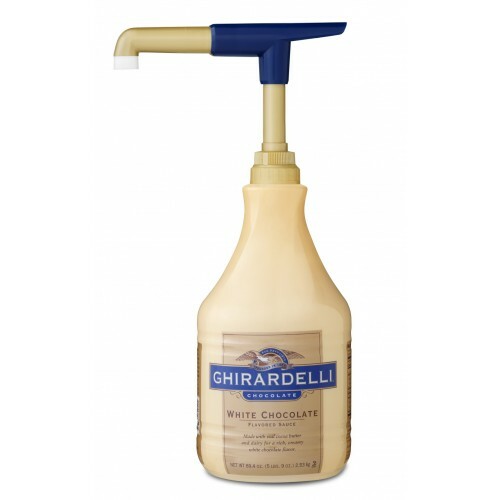 Ghirardelli White Chocolate Syrup is packed in a presentable bottle, equipped with a specialized pump, to dispense accurate amounts every time and minimize spills and waste. The intense Ghirardelli White Chocolate flavour will complement every dessert, and can serve to prepare hot and cold drinks as well as decorate plates, ice-cream and milk shake cups.